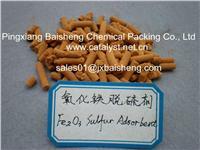 ZnO sulfur adsorbent is used under normal temperature. This catalyst could remove HS from cola gas, also it could remove nitrogen oxide colloid and cyanide. Normal temperature ZnO sulfur adsorbent is mainly adopt ZnO as active component adding auxiliaries on carrier. This catalyst could remove HS from cola gas, also it could remove nitrogen oxide colloid and cyanide. Used in nature gas desulfurization projects, manufacturing industry, fine chemical, metal processing products industry, ceramic industry, glass industry, electrical industry and etc to remove HS.